Victorinox Swiss Army Knife 2-sided revolving display stand. Made of wood with acrylic viewing panes. About 23 1/2" tall x 11" wide x 5 deep. Base with ball bearing mount allows display to spin around. I took apart and removed the double face tape residue as best I could from the interior, you can still see where the knives were mounted. Also price stickers removed from one end. You can see where they were stuck on there for years. Other side has all the various knife blades and multi-tools identified. Good overall condition, with a few paint chips, paint fade. The item "VICTORINOX Swiss Army Knife 2-Sided Revolving Store Display Case" is in sale since Sunday, December 24, 2017. 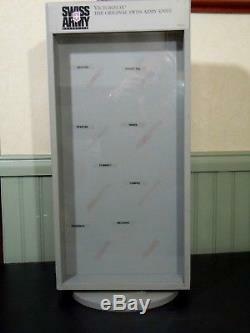 This item is in the category "Collectibles\Advertising\Merchandise & Memorabilia\Store Displays". The seller is "dufflite95" and is located in Putnam, Connecticut.